The Smart Way You Will Effortlessly Start Selling Online Pronto! We know that it is often confusing and technically challenging for entrepreneurs to get an online shop up and running; and if you own already an eCommerce website you know how important is to provide a pleasant shopping experience to your visitors. ...all this with a user friendly admin panel so you can maintain your online store with ease. IDEAS Creative Group is a web development company that specializes in Zen Cart development services. 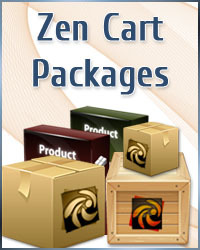 Zen Cart has much more to offer than what you expect. Our team of programmers with years of experience, will formulate solutions that not only satisfy your requirements, but also will make easier to manage your webstore. Nowadays we live in an information world, where knowledge is the key to success. Our group of programmers keeps updating their knowledge on the latest codes and functionalities to provide better solutions to you. Learning constantly helps us to stay ahead of competitors and deliver solutions of unmatched quality. BE VERY CAREFUL ABOUT THE TERMS OF SALE when buying templates. Do they include support for any problems you have? Do they assure compatibility with your version of the software? and other... AND ALWAYS CHECK THE REPUTATION of the person/company you're buying from by doing your own research. Many companies build templates for sale that are genuinely junk and just result in headaches. Many will hack out important core functionality just for the sake of making a certain thing look different ... but then you'll never be able to use the features they hacked out. And then you'll come here asking for support ... and we can't help you other than tell you to ask them for help or hack the original functionality back into the template on your own." We use the Zen Cart override system when coding template designs. We don't hack the code, deleting functionalities to just make it "look good". Still hesitant? You are welcome to read some of our happy customer's testimonials. Improve the way you do business online! If you are seriously thinking in starting your own webstore and don't know where to start; if you need a secured environment to accept payments through credit cards for your website; or if you already know exactly what you want and need a detailed proposal, contact me and I will gladly answer your questions. When starting a business plan in today's economy (and I mean today as it's ever changing) you'll need something unique that sets your business apart. For example: if you are selling a product or service online; probably Amazon can do it better, and that's scary. How will you compete with that? What makes you better than Amazon or other online retail giants? You have to figure out a way to engage your customers offering or doing something Amazon just can't do because is too big to accommodate.